Cape Town — President Emmerson Mnangagwa has done little since taking power to carry out reforms reflecting a commitment to respect for human rights, according to a new report from a leading advocacy group. In its annual "World Report", released on Thursday, the New York-based organisation, Human Rights Watch, detailed a range of areas in which it said Mnangagwa and other senior officials had failed to live up to "numerous promises to deliver governance reforms to mark the post-Mugabe era." They had taken "few steps" to demonstrate a commitment to "accountability, justice for human rights abuses, and respect for the rule of law," the report said. 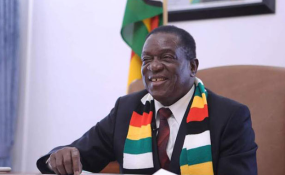 It added: "Mnangagwa, who has his own long record of human rights abuses, called on Zimbabweans in December 2017 'to let bygones be bygones,' paving the way for continued wide-spread impunity for abuses by the military and state security agents." In the area of freedom of expression and the media, the report said the Mnangagwa administration failed to review laws such as the Access to Information and Protection of Privacy Act (AIPPA), the Public Order and Security Act (POSA), and the Criminal Law (Codification and Reform) Act. "These laws were used under Mugabe to severely curtail basic rights through vague defamation clauses and draconian penalties. Partisan policing and prosecution worsened the impact of the repressive provisions in the AIPPA and POSA laws," the report said. And the the government failed to enact new laws or amend existing laws to bring them into line with the 2013 Constitution or the country's international and regional human rights obligations. The report also highlighted areas where the government had failed to take adequate steps to protect children and women. It had not yet taken steps to implement a court decision banning child marriages, or to deal with the eviction of widows from their marital homes and the confiscation of their property by in-laws. "Many of the victims continue to struggle to claim rights for reasons unique to their status as widows," Human Rights Watch said.